Ajax Cart extension is a great helper for customers to save time shopping on your store without reloading the page every time a new item is chosen to be purchased. Adds mini cart drop down for easy access to your shopping cart contents. Display all Magento product types right in your ajax cart. Allows to choose product quantity right from the product list page. Ajax Cart Magento Extension is a 100% customer friendly Magento mini cart drop down extension that will allow visitors to your store to continue shopping without waiting for product pages to reload every time new items are added to or removed from your shopping cart. This Magento AJAX cart extension is another usability improvement for online stores developed by the team of Plumrocket Inc. Many users find page reloading an irritating process. From now on, your customers will be released from the necessity of constantly waiting until the page gets reloaded. Instead, the number of selected items will be displayed in a mini shopping cart in the corner of the product page. Moreover, it is also possible to edit shopping cart contents from any page of your store. Our clients who have already installed this Magento Ajax Add To Cart extension claim to have observed increasing sales too. No wonder - their customers’ shopping process in not interrupted by useless page reloads anymore. Why don’t you try our Magento mini cart extension to see if it really works? Display product quantity using Ajax directly on the product "add to cart button"
Every customer will automatically receive a 100 reward points for each approved review. We use this extension on our store. No issues during the installation. It was easy to configure and integrate to our custom theme. Totally satisfied. What an amazing extension. Easy to customize and easy to install. Works like a charm. Support was very patient and very helpful. They fixed a minor issue with another extension. The extension is easy to install with complete documentation. The features are very nice and you can not go wrong with it. Keep up the good work Plumrocket! User friendly: I love this extension! This is the best Ajax Cart extension! Very useful, easy to customise, excellent compatibility with my theme. This extension is a must have and plumrocket support was superb. I have an Ultimo theme and it works splendid on it.I have also noticed some improvements in our conversion rates since I've installed this module. All the documentation guides are really easy to follow. Moreover it is also easy to customize the extension. Recommend it! Great extension, has a very cool popup that comes down and goes up later, just warning that the product was added to cart. The support as always super, very professional and concerned to solve. They know all about hundreds of Magento folders. Recommended! Great extension with excellent support! This extension was simple to install and easy to customize to match our customized templates. We bought several extensions and anything we had questions on, Plumrocket support was quick to answer and they didn't just answer, often they would actually do the mods for you and then provide copies & locations of the files modified so that we were able to learn the ins and outs of the extensions ourselves. Easy to install and setup! It's beautiful how this module works. The CSS is so simple to change if you need to do. We use for all of our customers. Thanks for your good job! Easy Integration and easy customization, as always fast installation and set up. Mobile Optimization is very nice! Plumrocket Support nice as as usual. The best addon I ever tried. I have bought the AheadWork extension before this one and I was not happy . I have try this one = Support and Feature are awesome .. Simply, i recommend Plumrocket ! Ajax Cart Magento Extension is user friendly magento extension that allow customers to shop without waiting for page to reload and save time. Check a documentation and frontend / backend demo to see it in action. It comes integrated with wishlist. I like the possibility for customer to see the number of product in basket on category page. 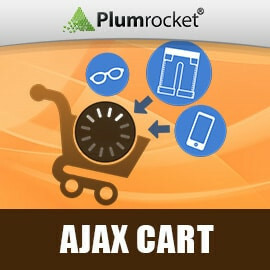 The Plumrocket Ajax Cart Magento Extension is simply the best Ajax Cart extension, i had a little trouble due to the compatibility with other extensions, but with a little bit of customization now it works like a charm!! We purchased this and it works nicely with Product Quick View. I really like that it shows a counter of how many items are in the cart next to the add to cart button. It was easy to install. We needed a minor tweak to make it work with another extensions we had, but Plumrocket support were amazing and solved the problem immediately. Highly recommended! I'll be buying more Plumrocket extensions in the future. Plumrocket installed and customized this extension for us. Size change on "add to cart" button, mouse over event on "mini cart" and also added an option for selecting other color item on "Popup"... so much more. I just love this extension. It was working with a Ultimo theme out of the box. Except for the CSS styling but the support was so great, that they fixed that as well! Makes ordering so fast and easy for the customer! This plugin makes it so easy and so fast for the customer to add items to their shopping cart. No need for browser refresh when they add items. It is a great plugin! The product itself is very useful, but it doesn't work out-of-the-box with same Plumrocket themes. The cost in this way becomes very high: you may evaluate cheaper solutions. Thank you for leaving your review. This is true, Private Sales Ocean Blue Magento Theme templates needs to be adjusted to display Ajax Cart nicely. Please note that other vendors do not offer built-in support of magento themes other than magento default themes. However, we at Plumrocket are proud to provide full built-in support of world's best selling Magento themes, such as: Default Magento RWD Theme, Magento Enterprise RWD, Ultimo Theme, Fortis Theme and Acumen Magento Theme. All other custom themes can be easily adjusted as per our installation documentation. We hope this information helps. Please do not hesitate to contact our support if you have any questions about our products. Purchased this to replace another more basic ajax add to cart as the features looked far superior. And we weren't disappointed. We did have some issues with the extension running on our store but the developers rose to the occasion and sorted everything out for us and got it purring along nicely. Great extension with excellent 1st class support. Allready have their size chart extension installed which was easily done, and now waiting on them releasing their checkout extension which we are looking to buy as long as its made responsive. The support of plumrocket was superb. We had some issues on our custom theme, but they helped us out very good and are now really happy with the result. We love the extension and the functionalitie. 5 stars! This is what I needed. Even though that it can look like a small addon, this extension was well equipped with many good settings in admin panel, and it is well developed. My customers appreciate it and so do I. Thanks team! Why did you choose this rating? Who would you recommend this to? Now the "Add to Cart" button will be inactive on the custom options popup if the selected product is "Out Of Stock"
Added mini-cart type: "Right Bar"
Added "Design" section for admins to modify colors of "Add to Cart" button, Minicart, Detailed Popup and Notifications.